The following explanation of Bishop Andrew Cozzens’ coat of arms is from the worship aid used at his ordination Mass Dec. 9. 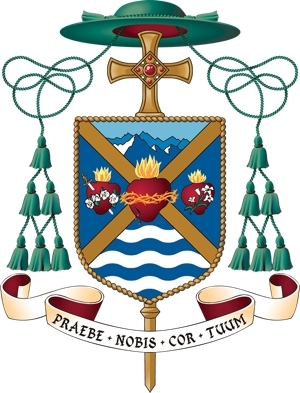 Bishop Andrew Cozzens’ coat of arms is divided into four sections by the St. Andrew Cross. Like his patron, St. Andrew, Bishop Cozzens wishes his entire life to be conformed to Christ through laying down his life for Christ’s bride, the Church (Ephesians 5:25-26). At the center of the cross is the Sacred Heart of Jesus, representing Bishop Cozzens’ desire to make present through his episcopal ministry the love, mercy and healing that flow from the pierced heart of Christ for the salvation of the world. To the left of the shield is the Immaculate Heart of Mary, to whom Bishop Cozzens entrusts his life and ministry as a bishop. Sharing with her in the sufferings of discipleship (represented by the sword in her heart), he hopes to share in the fruitfulness that flows from this suffering (represented by the roses around her heart). To the right of the shield is the heart of St. Joseph, with a staff of lilies representing his purity and his identity as guardian of the Holy Family. Like St. Joseph, Bishop Cozzens takes the Church as his bride in chaste love and seeks to love all her children with a father’s compassionate and steadfast heart. St. Joseph is also known as “protector of virgins,” a title which reflects Bishop Cozzens’ deep love and gratitude for consecrated religious. The top or “chief” of the shield hails a landscape of mountains representing Bishop Cozzens’ native state of Colorado, where he learned to climb mountains, as well as the call of every Christian to seek ever-greater heights in the spiritual life. At the base is a field of blue and white waves taken from the coat of arms of the Archdiocese of St. Paul and Minneapolis, in which he was ordained to the priesthood and will now be serving as auxiliary bishop. The water reminds us of the new life of baptism, which is the beginning of every Christian’s life in Christ’s love. Around the border of the shield is seen a three-ply cord, which represents the importance that Bishop Cozzens attaches to priestly fraternity, as well as the gratitude he has for the fraternal life he has shared in the Companions of Christ, a fraternity of diocesan priests in the Archdiocese of St. Paul and Minneapolis and the Archdiocese of Denver. The three-ply cord comes from the Book of Ecclesiastes: “Where a lone man may be overcome, two together can resist. A three-ply cord is not easily broken” (Ecclesiastes 4:12). Behind the shield is a gold Celtic cross, symbolizing the Irish ancestry of Bishop Cozzens. The five red stones set within the center of the cross represent the five wounds of Christ. As St. Peter tells us, “By his wounds you have been healed” (1 Peter 2:24). Through these wounds, Bishop Cozzens desires to make known Christ’s healing love. Bishop Cozzens has chosen as his motto, “Praebe nobis cor tuum,” which translates, “Give us your heart.” The motto is taken from the final line of a prayer by St. Louis de Montfort to Our Lady. This prayer was dear to both Blessed John Paul II (“Totus tuus” — the first line of the prayer) and Blessed Mother Teresa of Calcutta (“Praebe nobis cor tuum” — the last line of the prayer), to whom Bishop Cozzens has a special devotion. This motto expresses his desire to be united with the heart of Jesus through the heart of Mary and to lead others to this same union.